Ahh! Thanksgiving! The Turkey is taking center stage this year. Well - don't tell him but he is not the only Tom at the Table, he will be sitting with my husband, Tom, and our youngest, who we lovingly refer to as T.R. - also a Tom. I will have to admit right up front - I have never cooked a turkey!! I have no longing to cook a turkey and I am fine with never having had to cook a turkey thus far in my life. Oh sure, maybe some day - but my wonderful mother-in-law is only 20 years older than me and has always hosted Thanksgiving for our family. That is just one of the many things I am thankful for! Working in retail service for a toy company has me very busy this time of year. I work very late on Wednesday before Thanksgiving and also get up early to work on Black Friday the next morning. So cooking a huge meal and hosting this holiday has never been top on my list of must do's! 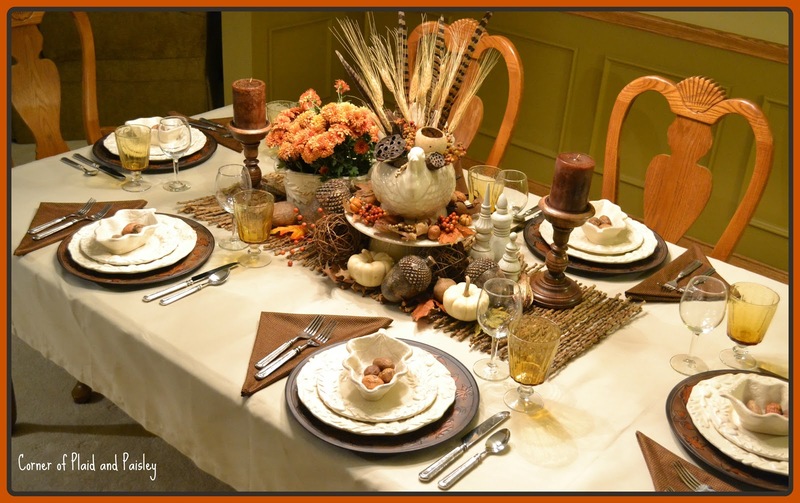 Although, I may not cook the dinner, I do love setting the table! As a child that was always one of the chores I never minded doing, especially for the holidays. This was one of the few times my mom used her "good dishes"! There was always something about the gravy boat that I loved!! Weird, I know! My dad and uncle always went pheasant hunting on Thanksgiving morning. Hunting, fishing and growing our own food were means of many meals back then. If that were still the case - I would probably go hungry! Now the meaning for hunt is looking for a good recipe on Pinterest! 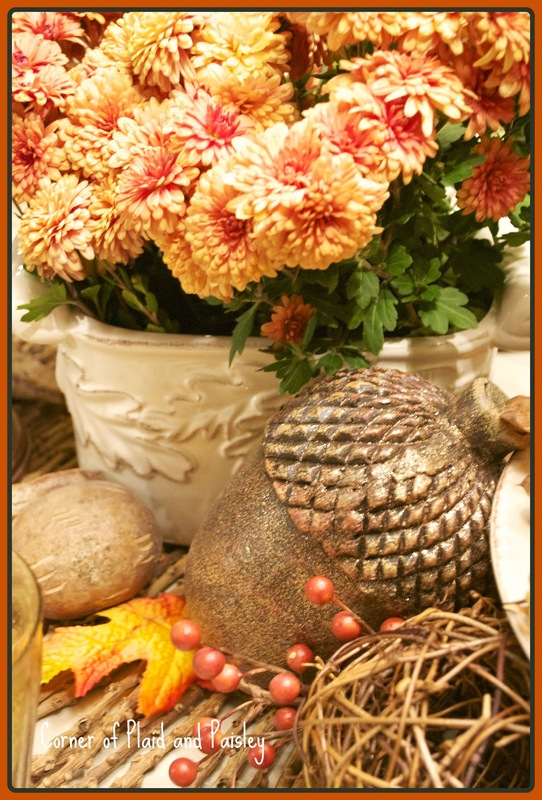 I picked a few mums from my garden for this beautiful fall ceramic piece that I just had to have because it matched the dishes!! I wasn't sure if I was going to fill it with mashed potatoes or broccoli - but I think I like it filled with flowers even better. My prayers continue to be with my friends on the east coast, still unsettled from Sandy and the storms following. I hope all of you who stop in to read my blog now and then know how grateful I am for your friendship and how much I enjoy your comments. I have a lot to be thankful for! Dishes - tii Collections - Dol Harvest Leaves- from Butterchurn Kitchenware in Walnut Creek Ohio- a real deal at 40% off!! 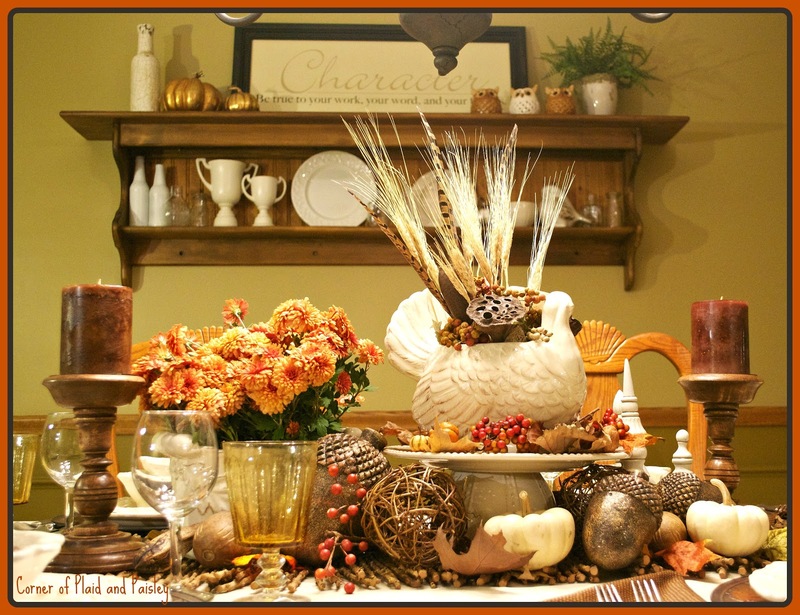 Lovely tablescape! I especially like the little dishes in the center of the plates. Beautiful Tablescape!! Love the natural and rustic elements! Thanks for stopping by my blog and leaving a sweet comment! Totally Terrific Table and love your Tom Turkey! I really enjoyed your post on not cooking on Thanksgiving and you are a very busy person being in toys this time of year. I love the cute not the only Tom at the table comment! 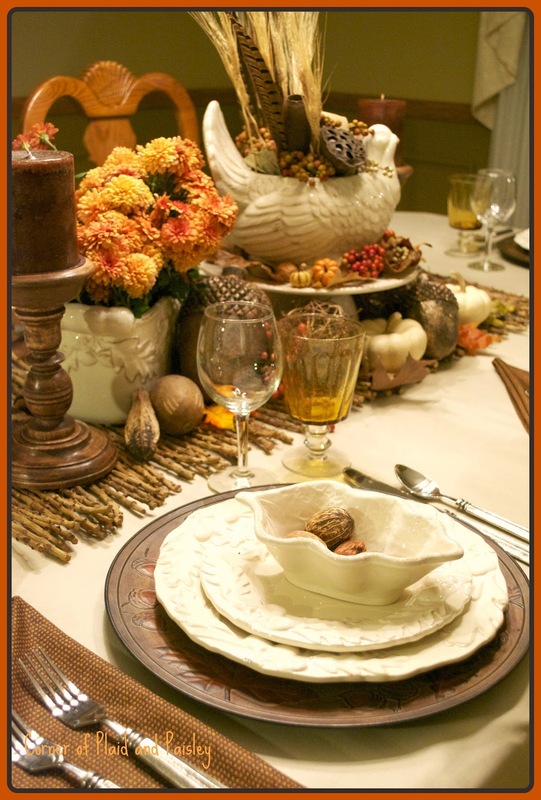 Your tablescape is very elegant and the china is perfect with your centerpiece! 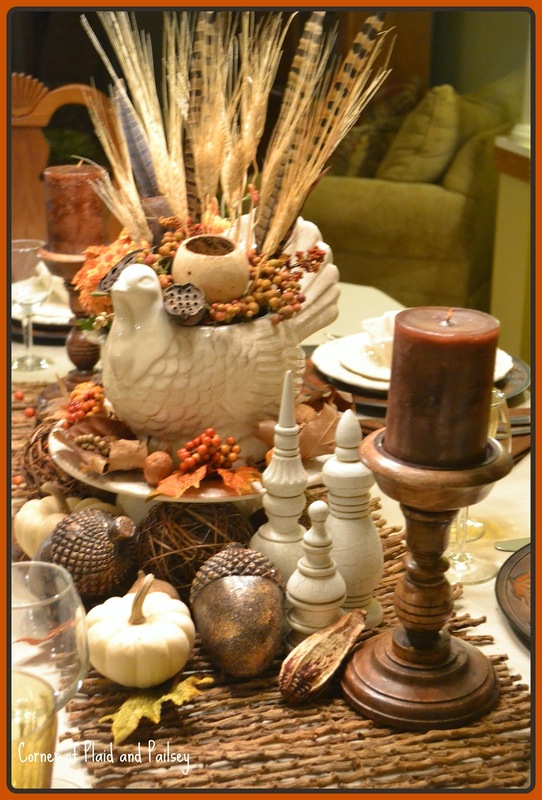 The centerpiece is so beautiful with the creamware turkey and planter and how you arranged all the accessories. 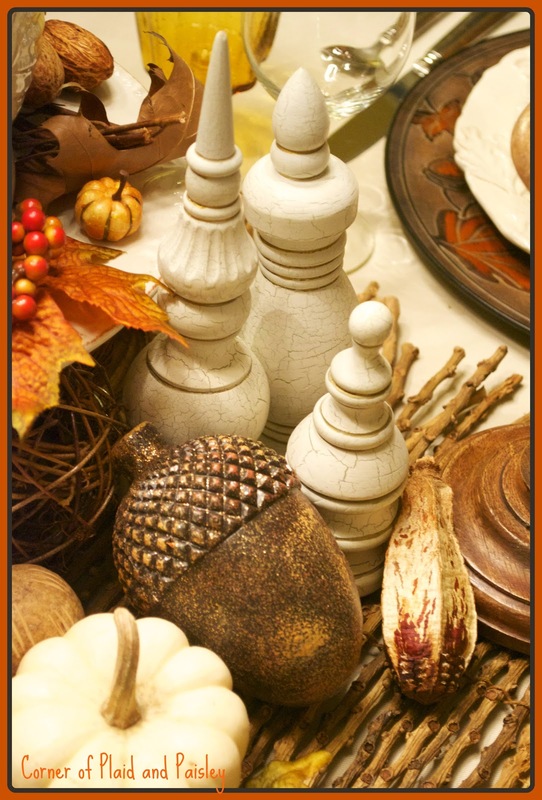 Have a great Thanksgiving and great some rest before Friday! Such a beautiful table! I really love the green wainscoting in your dining room. I can tell I like your style and I will be following along now. This table is beautiful. I don't cook turkeys either but love setting the table. I used to order the whole turkey dinner when we lived in Fl, from Boston Market. My son would say that his mom is the only one he knows who can make Boston Market turkey look so good on the table, lol. Love your Tom Turkey centerpiece! You did a beautiful job of fluffing him out! I love the bamboo runner down the center as it adds a rustic, textural element to the table. How nice to have your dear MIL prepare the meal. Hi! 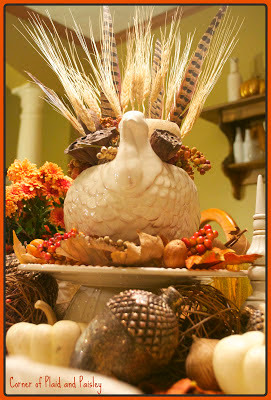 I love how you dressed up your Tom Turkey centerpiece! The feathers look awesome! I like your chargers (I used the same ones)! Those are some giant acorns! The dishes look beautiful! I can't believe you've gotten away with never roasting a turkey! Well it's wonderful that you have someone to do the dinner- especially since you work such tough hours! Have a wonderful Thanksgiving day! A very pretty table. You did a great job. 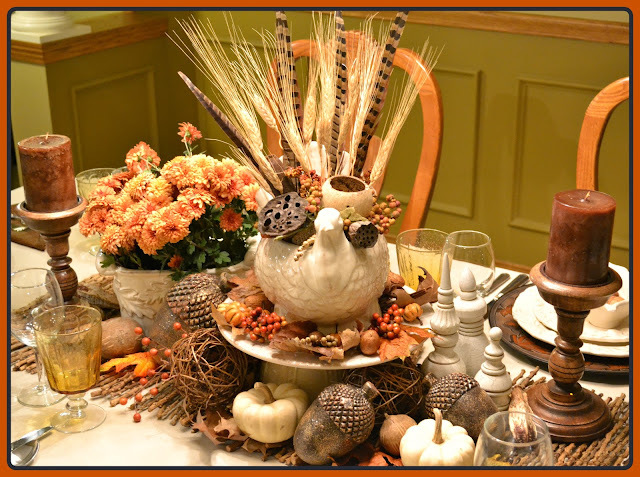 And setting a pretty table is as much of an art as cooking! Wow, gorgeous table, Ann! The centerpiece is fabulous, with so many different textures. Have a great Thanksgiving dinner. Cooking a turkey is over rated!! Love the centerpiece!! Love the stick runner. This is a great table, no matter who cooks. I think you could just have a sandwich here and be happy!